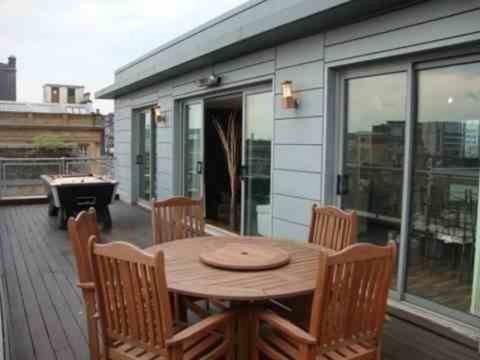 Located on Glasgow’s famous Buchanan Street, this penthouse apartment has a large decked balcony seating area. Shops, restaurants and bars are all within 100 metres of the Serviced Apartment. An l-shaped leather sofa, a flat-screen TV and a DVD player feature in the stylish lounge. A microwave, dishwasher and washing machine are included in the modern kitchen. Large glass doors lead from the wooden-floored dining area onto the balcony. A king-size bed is in the purple-themed bedroom and the fully-tiled bathroom has a shower over the bath. Glasgow Central Rail Station and the Gallery of Modern Art are within 5 minutes’ walk of the Serviced Apartment Buchanan Street. The Buchanan Galleries Shopping Centre and the Royal Glasgow Concert Hall are less than a 10-minute walk away.